In the beginning there was the SansAmp. 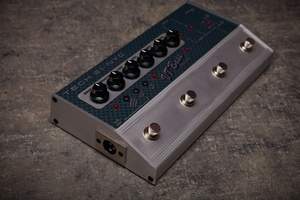 This very practical stompbox for guitar players simulated famous classic amps and allowed the user to feed a mixer directly. Since this concept wasn't interesting enough for existing manufacturers, B. Andrew Barta, its inventor, had no other choice than to create his own company to market his product. Ever since 1989, his attempt based on a commercial certainty and a pioneer design became quite a success. 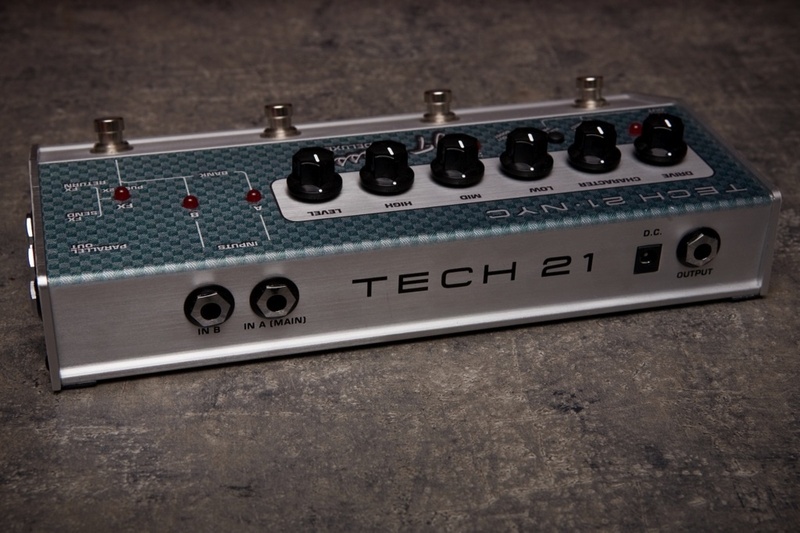 From the very beginning, the SansAmp provided dedicated bass guitar settings that reproduced the sound of a Fender Bassman. Since then, this preamp/DI box has been available in different versions known under the generic name Bass Driver DI: the Bass Driver Programmable already offered internal memories before it became the Bass Driver Deluxe, which provides the user with twice as much memories (six channels instead of three) and an integrated FX loop. 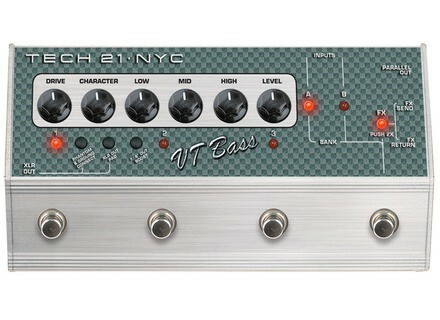 In 2008, Tech 21 launched the VT Bass, offering fans of the legendary brand the possibility to enjoy the sound of their favorite stacks in a stompbox. Flagship of the Character Series, the VT Bass is now available in a Deluxe version. In other words, you can now store your favorite settings, get rid of ground loops (thanks to a balanced output) and connect your effect chain in a parallel loop. A practical and analog evolution. Welcome to the VIP area! The control panel is easily readable for users with limited knowledge. On the front panel you have six controls: three-band EQ, output level, input gain (amount of distortion), and Character. Let's have a closer look at this last control to explain what it does: the Character setting affects both the tone and the gain, and allows you to radically change the sound turning a single knob. The closer to "0" the fuller, rounder and more vintage the sound is; in the center position, the tone becomes more modern and hollow; higher settings produce a brighter and dirtier response. When set to max, the distortion is higher than the signal. That's quite something for a single knob. The sound samples below ought to give you a better idea of what we mean. Now, let's have a look at the switches: three footswitches control the three programmable memories while a fourth footswitch allows you to change the sound bank and switch the FX loop on/off (pressing the footswitch twice). Like on all Deluxe products, the fourth footswitch provides you with a really clever option: you can connect two different instruments to the unit at the same time, where each bass guitar uses its own sound bank independently. 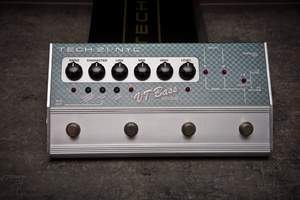 In other words, when you connect two bass guitars, each instrument can use up to three memories and the fourth footswitch allows you to toggle between both basses. This is one is really high in the list of clever ideas! Besides the four footswitches, you also get three switches to control the signal of the outputs (XLR connectors plus 1/4" jacks): the first switch allows you to power the device (48 volts) with the XLR connector, or to activate the Ground Lift function to avoid ground loops. The second switch activates a -20dB pad in the XLR output to avoid any overloads. The last switch is a +10dB boost for the 1/4" jack out. By now you have surely guessed six of the available connections: two instrument inputs, one 1/4" jack output, one XLR output, and one FX loop. The seventh connector is a 1/4" "through" jack that allows the unaffected signal to be redirected to a tuner or an additional amp. Imagine yourself on stage with a preamplified signal for the FOH mixer (or/and a recorder) and an additional "clean" signal to feed an amp for monitoring. You can also use two amps: one for the "clean" signal (connected to the parallel out) and another one for the signal processed by the VT preamp with its numerous distortion possibilities. A last word about the 9V power connector for an external PSU: Please note that neither an external PSU nor a battery are provided. Alkaline greed is a trademark! Imagine yourself with your bass guitar, your amp and your brand new stompbox you just took out of the box. You're about to use your new toy for the first time and... Don't say a word: stand up slowly but resolutely, grab your coat and put it on. Pull up your collar and walk to the closest store to get the bloody missing battery. Now, it's time to plug some cables and start with serious things. For this review, I connected the VT Deluxe directly to my Novation audio interface via an XLR cable. To avoid ground loop problems, the manufacturer recommends the use of a battery. In order to see if the settings are really effective, I used the most simple bass guitar in the world: a passive, standard Fender Precision. For the sound samples, the tone control of the single-pickup bass is in the center position. Everyone knows the sound of this classic instrument and its simplicity is just perfect for our purpose. So, I used the VT as a studio preamp and the 10" speaker simulation conceived to make the output signal rounder. 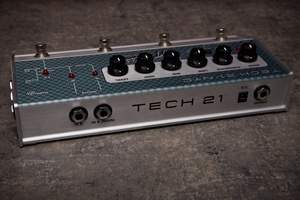 Once again, don't forget that you can also connect this pedal to a bass amp. The best way is to use the FX loop or the power amp input of the bass amp. You can also use the instrument input of your amp but the preamp stage will color the signal of the VT. If you want to use your VT Deluxe as a complement of a stage amp, I recommend you to check the connections of your amp. As mentioned above, the following sound samples describe the possibilities provided by the Character control. The first sample was played in bypass mode so that you can use it as a reference. For the second sound sample, I turned on the preamp and set the Character control to 0. For the third sample I turned the Character control up to the center position, and then to max (sound sample 4). The EQ setting is flat in all four samples and the input gain setting is low enough to avoid any distortions. You'll hear the tone variations depending on the position of the control. At "0", it gives you a round, full, vintage tone. Increase the setting to add distortion to the high-frequency range. When set to max, the sound becomes very dirty. It's all a matter of taste... Note that this setting has no neutral position, which means that every turn represents a small variation. This results in the impossibility of deactivating it: every time you change the EQ or input gain settings, you'll have to readjust the Character control to get the sound you are looking for. 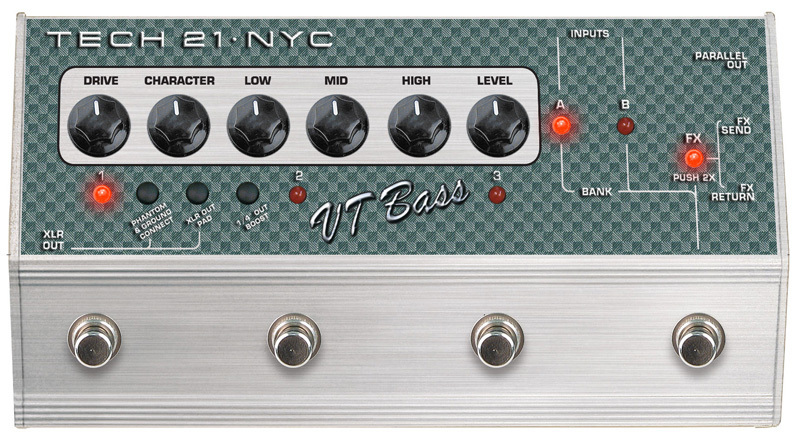 So, to wrap it up, the VT Bass can't be set like any other bass amp. I changed the EQ settings for the three following sound samples. For the first sound sample, Low was boosted (2/3) while Mid and High were attenuated (1/3). For the second sound sample, I wanted a hollow sound so I attenuated the Mids while boosting Low and High. For the last sound sample, I boosted the Mids and Lows (3/4), and turned the High control to center position. 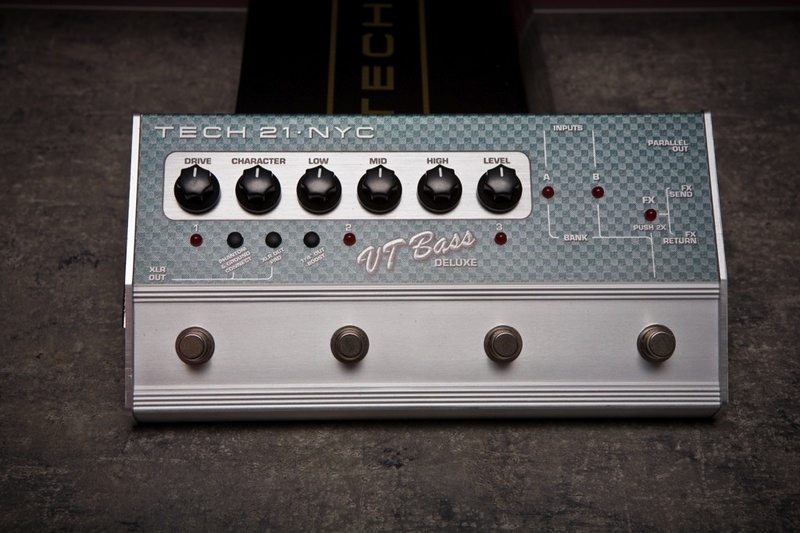 The samples above only show the basic sound options provided by the VT Bass Deluxe. So now we have three options in one bank: clean sounds for groovy music. Now, let's use the three remaining memories for the different distortions the stompbox can offer. I tried to keep it simple and just used the settings suggested by the user's manual. First, the Flip Top style: a slight saturation that boosts the mid range. The SVT style adds a slight distortion and compresses the low end. The Rage mode provides you with an overdrive that bends a bit the frequency response. Finally, Fuzz Out produces a rather extreme sound; so extreme that it becomes almost uncontrollable! You'll have fun shaking the walls and drilling the ears of the sound engineer. Even with a basic instrument, all advantages of the VT Bass Deluxe as a studio preamp are obvious. The sound color is easily recognizable and quite authentic. The connections are comprehensive and the overall design is very well thought out. The memory system is simple and requires no graphic display. The housing is robust and the quality of the finish and footswitches is alright. From the earliest days, the brand has been developing and manufacturing products that are basically analog, which has proved a successful strategy: it allows them to reduce the dimensions of an amp to the size of a stompbox without using any digital processor. That's not only good but also comforting, considering that the future tends to be more and more like a bunch of 0's & 1's. 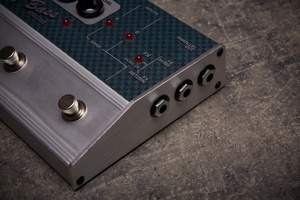 If you have $270 in your pocket and are looking for a solution for your studio sessions, consider this effect pedal — especially if you like classic sounds, like I do. Distortion fans will also like the product due to its many distortions, even some extreme ones. You could say that the product offers something for almost everybody.